March | 2016 | US Registries LLC. 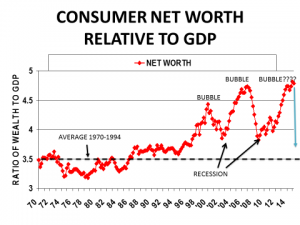 The Net Worth Bubble, Losing Air. American consumers have about $14 trillion in debt and a net worth of over $80 trillion according to the Federal Reserve. Net worth is the sum of the values of all assets, real and financial, that consumers own, less their debt, including mortgage debt, leases, credit cards and the like. The wealth we hold is a way of storing purchasing power. You can sell your shares of Apple and buy “stuff”, goods and services. Ultimately, for most consumers, that’s what our wealth is used for, to acquire “stuff”. Some of our assets provide services directly such as our houses and cars. The real services received from these assets would seem to be unchanged over time even though their market prices vary. Financial assets do provide an income that can be used to buy stuff (although interest income was dramatically reduced by Fed policy, dividends held up reasonably well). And part of the goal of Quantitative Easing was to induce people to buy more stuff (real goods and services) as their asset values were inflated by Fed policy. On first blush, not much of this seemed to occur. That said, the total value of our net worth represents a potential claim on stuff, the real output of our economy. The broadest measure of “stuff” is the Gross Domestic Product, the total value of final goods and services produced in a given period of time. Constructing the ratio of Net Worth to GDP illustrates the fluctuation of claims on output per dollar of output produced. Not surprisingly, this was a fairly steady series for 25 years (maybe longer) from 1970 to the mid-1990s as gains in nominal wealth were matched with gains in nominal output, averaging about $3.50 in claims on output for every $1 of GDP. The advent of the dot.com era (and Y2K) drove the ratio up to $4.40 and then the housing bubble up to $4.80. Real housing services received in that period likely did not rise and fall with house prices. The end of the housing bubble drove the ratio back down to $3.70, a full dollar, but still 20 cents above the 25 year average from 1970 to 1995. Each peak was followed by a recession, the last one the worst since the early 1980s. And now the ratio has once again reached $4.70. “History” suggests that the ratio will collapse again toward the $3.5 level. This can be accomplished by a massive increase in real GDP (unlikely) or a massive decline in the value of assets (more likely). The economy is not likely to fall into a recession in the next year or two, but growth will be historically modest. What can impact the market value of assets? The return of “normal” interest rates, weaker profit growth, a serious global slowdown, each could trigger the “adjustment” in net worth. The adjustment might be accelerated because of widespread short covering and record high margin credit and other leverage. Logically this seems unavoidable, unless you believe that we are truly wealthier now, even with an economy that is delivering a rather poor performance (historically weak output and sales growth) in real terms. It would seem to not be “whether” we will adjust but ‘when’ and ‘how’ that will challenge the money managers and prognosticators. 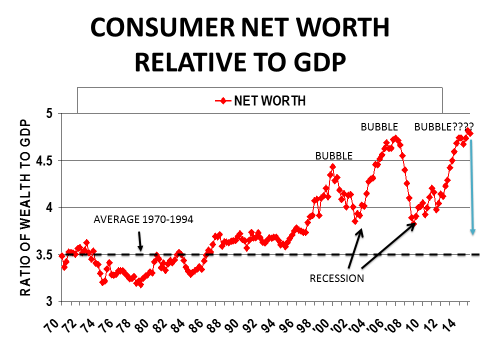 Every bubble is different, this one will be about stock prices as well as bond prices, missing in earlier bubbles which occurred during the steady decline in interest rates that started in the early 1980s. This time, rates will likely go up, not down. Since writing this piece last year, central bankers have developed a new tool, NIRP. At 0% or negative rates, there is mathematically no limit to how high bond and equity prices can go. Real earnings can fall while asset prices rise as people put their money into any asset rather than hold cash. Asset prices will rise, yields will fall. Cash will be a “hot potato” that we can’t get rid of. Should the Fed become so disconnected from reality and common sense that it moves to “negative interest rates”, equity markets can rise, at least for a while. Ultimately, the value of “shares” in USA INC will depend on the economy’s real performance. Main Street Strengthens but tough lending conditions still continue, see the full story here.